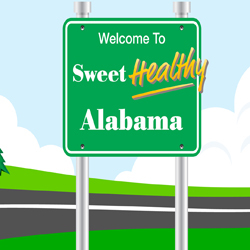 "Creating a healthier Alabama through obesity reduction and prevention efforts." "The Alabama Obesity Task Force works through collaboration, programs, policy and environmental changes to support and promote healthy lifestyles." The Alabama Obesity Task Force is a volunteer membership organization that addresses obesity through advocacy, changes and programs. Please read our brochure (2 MB) for more information on the goals and objectives of the Alabama Obesity Task Force. If you would like to be a part of the Task Force, please complete the application form and submit it via email. According to 2017 data, Alabama's rate of adult obesity is 36.3%, which places Alabama in the fifth highest position. Visit the CDC for more information. Visit Obesity and Chronic Disease to learn more about the link between obesity, cancer and chronic diseases such as hypertension, diabetes, heart disease, sleep apnea, mental illness, and osteoarthritis. Visit ADPH's Cancer Division to learn more about obesity and cancer. Some cancer risk factors cannot be avoided; however, maintaining a healthy weight is a behavior choice we can control. A major goal of the Alabama Obesity Task Force was to develop and implement a comprehensive, realistic state plan that will reduce the worsening obesity epidemic in Alabama. The plan was not to change approaches already in progress, but rather to create a uniform approach to reduce obesity. The Alabama State Obesity Plan provides goals and objectives to follow at various social-ecological levels. The plan provides various approaches to address the impact of obesity on Alabama's citizens including education and awareness, lifestyle and behavioral choices, community-based environmental strategies, school and worksite improvements, and policy development or changes. You can read the plan in its entirety at the link below.